Excavation Services Santa Cruz & Monterey CA - Watsonville Grading & Paving, Inc. When preparing land for construction in Monterey or Santa Cruz County, it is vital that the excavation be done right. Is the land being used for a building, a park, or a roadway? Then it needs to be leveled or graded. This is vital before any construction begins. In a sense, excavating land in the right way is as important as laying a building’s foundation correctly. 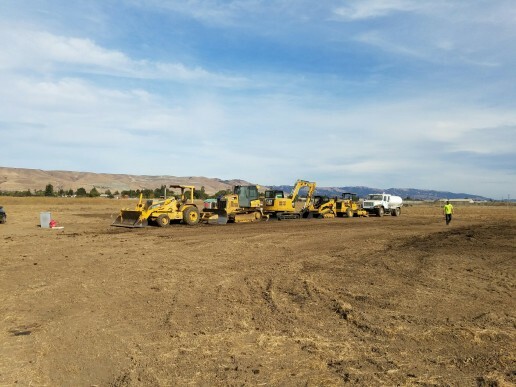 We are a major provider of excavation services in Watsonville, CA and in Monterey and Santa Cruz County. Our team of experts will ensure that any land clearing is performed according to the highest standards. The following are important elements of excavation to which we pay special attention and that require a top quality approach. In some cases land needs to be prepared for a road. In other cases, such as a shopping center, a parking lot, landscaping or possibly drainage ditches. For each case the team undertaking the excavating needs to approach each project differently. The excavating process is never the same and they need to be aware of the use to which the land they are working on. Sloping Land Usually Needs to Be Leveled. Before construction begins, it is important in most cases to ensure that the land is level. In many cases, however, the ground on which the buildings are to be constructed has some degree of slope. From ground that is situated on the side of a hill to those that are on gently uneven land it’s important that the land be level. When land clearing is undertaken, the ground on the high end of the slope needs to be removed and placed on the lower level. Eventually a level surface is established on which the contractor can begin work. In some cases a construction project requires the land to be graded so that it flows gradually from one level to another, such as in road construction. Creating such grading can often be demanding and can require the use of GPS equipment. A significant challenge on sloping land is the possibility of drainage problems occurring after the ground is cleared. Sloping ground means rain or runoff that has always flowed from the higher part of the land to the lower level will continue. The water will tend to remain on the lower part of the slope unless adequate steps are taken to control the drainage. Doing so is a challenge to the excavators when leveling the land on which the project is to be built. Sometimes this task can be particularly demanding and requires great precision. This process remains essential or else the building will be established on land that is continually damp. The land will be subject to damage from water over time. However, land that is leveled for farm use or to allow irrigation will likely want to retain the water or channel it to nearby farm land. In order to be eco-friendly, the land should be prepared so that it is not subject to erosion or other forces of nature. Rain and water can wash away soil and cause damage over time. This aspect becomes particularly important when preparing land for a park or a similar open land facility. Another aspect of land clearing is that sources of contamination sometimes exist in the soil and need to be removed. In some cases, occupants of previous buildings on the site might have spilled chemicals or oil into the ground. Similarly, the land might have been used as a dumping place for all kinds of refuse. Chemicals or refuse that should have been correctly disposed of in a landfill or other facility. When digging in Santa Cruz and Monterey County it is vital that attention be paid to existing utility lines. Gas and electrical lines that already exist on the property need to be handled properly. In addition, trenches might need to be dug for future utilities, such as sewer, gas, water and cables as well as storm drainage. We are the Watsonville, CA excavation experts. If you require excavation services, asphalt sealcoating, grading, paving or a number of other services, contact us today. Our team of experts will ensure that your project is undertaken to the highest standards possible.